The EOS 100D is an engineering marvel and while we doff our hats to Canon for showing off in making such a small DSLR, it doesn't match up to head nor heart: the 700D is better in every way and this puts the brakes on the 100D for us. However, paired up with the right small-scale Canon glass and the image quality is undeniable - it remains an impressive bit of kit, it just won't suit all users. When Canon came to update the EOS 650D DSLR it did something not entirely expected: while the inevitable EOS 700D surfaced, so too did the brand new EOS 100D, a shrunken DSLR some 25 per cent smaller and 28 per cent lighter than the DSLR. A whole new category is born. Well, sort of. The 100D unhinges Canon's typical numbering system - the smaller the number the more advanced the model, which is now no longer the case. That's impact enough in itself unless you're based Stateside, where the model goes under the far more sensible Canon SL1 moniker. And what of Canon's EOS M compact system camera - is the 100D an attempt to brush up where the M fell short and what compromises, if any, come with the 100D's smaller-than-typical-DSLR scale? Does it make any sense in the face of the 700D? The moment you pick up and handle the EOS 100D it feels like an entirely different kind of DSLR on account of size alone - it really is dinky. For some that will be the perfect concept, while for others the design will be too small. We found a stray pinkie would search for space on the cameras's grip but, alas, such space does not exist which made for uncomfortable long-term use - and we think the same will be true of many potential users' hands, though maller-handed users might find this scale spot on. But even at this scale Canon's managed to keep most of the features big in spite of the size. It's a bit of an engineering show-off really: the cut-back size has been achieved by redesigning the shutter mechanism, as well as the sensor module which, despite still being the same base unit as the 700D's 18-megapixel APS-C sensor, has considerably smaller surrounding components. It's clever stuff. However, the scale does impact on specification to some degree, even if the features list isn't hugely different from that of the EOS 700D. The main thing that jumps out is that the 100D's 9-point autofocus system has just one cross-type sensor at the centre, whereas all nine of the 700D's AF points are cross-type. That makes the 100D less sensitive towards the outer areas of its autofocus diamond array when held in the portrait format - something that might not impact use as drastically as it sounds. The built-in optical viewfinder manages to offer the same 95 per cent field of view as the EOS 700D, but is ever so slightly smaller. It's hard to spot unless you have both cameras side by side - something we've played around with - and it looks as though the height of the 100D's finder is marginally less. The size makes little to no impact in use, but over extended periods of use in a variety of conditions we've not found the settings display to be particularly bright - the green aperture and shutter values just don't show up as strong as they should, which doesn't sit well in bright sunlight. In our review model we also found that the lower three AF points leaked their red confirmation lights to surrounding areas - not a serious point, but not as tidy as we'd like it to be when more or less living through the viewfinder. Elsewhere the 100D's layout is a subtle twist on the typical Canon DSLR design. The buttons, much like the camera itself, are of a shrunken size yet still satisfactory and responsive, while there's only the one main thumbwheel to the top and no rotational d-pad to the rear can make for less immediate adjustments compared to some EOS equivalents. If buttons don't float your boat then the touchscreen comes in handy - it may not be the vari-bracket screen as on the 700D, but is equally responsive to the touch. This opens up a different way of working, either selecting the autofocus point by the touch of a finger or jumping quickly to the desired selection from within a menu. There's something rather "EOS M meets EOS 700D" about the 100D. In many respects we think it puts a question mark over the M-series compact system camera for a variety of reasons. The M isn't all that tiny as compact system cameras go and its performance is rather mediocre - the 100D walks all over it by comparison. Which makes a good case for this dinky DSLR: small size doesn't mean small performance. The 9-point diamond-shaped array can be set to a single focus point or you can open up all nine points to the camera to take command of via the rear AF select button. Press it while looking though the viewfinder and it will show the current selected AF point, which can then be moved via the rear d-pad; press it again and all nine points are selected in an auto-area mode. In addition to the one shot single-focus mode where manual focus override is possible, there's also AI Servo for continuous autofocus and AI Focus which is a half-way house between the two (without manual override). For a brand new user drawn to the 100D on account of its size, such options are far from self-explanatory and there's no way to query what they mean from within the menu system. Even though it sits below the 700D in the rankings, the complexity is much like that of any other middling Canon DSLR. We think it would have made more sense to have built in some degree of education - beyond that of the "CA" creative auto mode on the top dial - to get the best out of some of the available settings. In use the autofocus system is swift in operation - it's very similar to that in the 700D and capable even in low-light conditions. One area we were rather impressed with was the 100D's ability in live view preview, where the rear LCD screen can be used to preview the shot instead of via the viewfinder. In accessing this mode the standard phase-detection autofocus system is bypassed and the sensor takes command. But in the case of this particular sensor - as first introduced in the EOS 650D - there are select pixels on its surface which operate a phase-detection system and, while it's not as nippy as when using the viewfinder, it's decent enough to work with and well beyond that of most other DSLR live view systems. With the included 18-55mm kit lens, which is also new, the proportion to the body is fair, but we've spent a lot of our time using the camera with the 24-70mm f/2.8 L-series lens which is a far larger chunk of glass. We're impressed with how it operates in conjunction with the autofocus system, but such a lens on the front of such a small body can feel rather strange in the hand - it's front-heavy in the extreme and the lens itself provides more of a grip than the camera body does. It's that last point which got us thinking: is the EOS 100D anything more than a single purpose, one-off buy? It makes practical sense with, say, the 40mm pancake lens or other such stubby lenses, but for longer zooms it doesn't quite gel. It's as though this latest DSLR is all about aligning itself with a particular section of Canon's EF range. Nothing necessarily wrong with that, but a thought nonetheless and we still think it kills off the EOS M to some degree. It's even pinched the EOS M's battery which gave us fear that its life per charge would be poor. But it's not: we've been snapping over a long bank holiday weekend and even at 380 shots deep the battery was showing as full. We didn't need to recharge it once over a couple of days and far exceeded the quoted 400 shots per charge. That's way better than what we managed with the EOS M.
The 100D's 18-megapixel sensor is based around the same one as found in both the EOS 650D and 700D, yet by design it's completely different because of all-new components. That doesn't mean the exposed sensor size is any different compared to other 1.6x crop Canon sensors, however, it's all down to different architecture. That's something not to be overlooked as the new layout means heat-generating components are closer together and lingering heat can in turn mean more image noise. 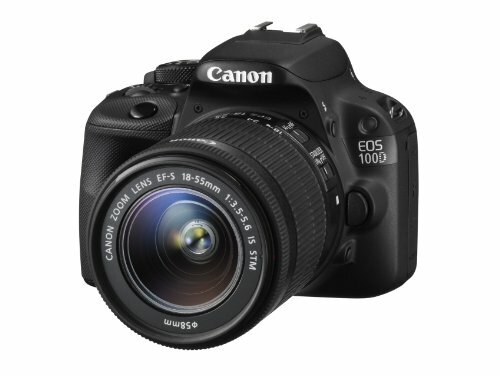 Does it affect the 100D's resulting quality? In short: no, not from what we've seen. There may be subtle technical differences between the 700D and 100D but we're just as impressed with what this mini DSLR is capable of producing. It may be small, but it's not cutting back on the quality front. Out of the ISO 100-12,800 sensitivity range, which is available up to ISO 6400 in Auto ISO mode, the results are impressive. Cast a critical eye over shots and the middling ISO settings from ISO 800 and above do display some subtle image noise but it's nothing too much to complain about. It's a lot like the EOS 650D, which means even the higher ISO settings impress. We've used the 100D in a variety of dim conditions and even at ISO 3200 the raw files have a grain-like noise but not a great deal of colour noise interference to shout about. Raw and JPEG files do differ by quite a significant amount, however, and in all cases we found the CR2 raw files to deliver more detail, particularly at the higher ISO settings. We'd recommend shooting raw at all times, however, as there's a touch more critical detail, a wider colour palette that can visibly be seen when comparing file types and more room to breathe when it comes to exposure. Exposure is usually on the money, although we did find in bright conditions that it would be pushing the threshold and sometimes highlights blew out. That can be corrected for with exposure compensation or in post-production, but it's something to keep an eye on when shooting. Colours and bright and punchy and there are even in-camera options for pre-set picture styles, including in-camera black & white. If you want to get extra creative then there are filters - such as soft focus, water painting, toy camera, miniature effect and so on - which can be applied after snapping an image. Canon rarely takes its eye off the ball when it comes to image quality and the 100D produces mighty quality despite its small size. It's no compromise on the image quality front as far as we're concerned. The EOS 100D may be small, but it still manages to pack in the power and we've generally been impressed. But, in saying that, you'll need to really want a smaller-scale DSLR in order to go out and buy one. For just £50 more the EOS 700D offers a more advanced autofocus system, larger build for what we think is a more comfortable use over an extended period, a better battery life and vari-angle LCD screen too. It's just all-round better, which puts a lingering question mark over the 100D. Size definitely counts for something though, and while we think the 100D is here to take the pressure off the EOS M to some degree, pair the 100D up with smaller-scale Canon glass and it's the small scale that sells it. In context to the rest of the Canon range there's no other reason to pick up this model though. This is a tricky camera to score. We've ummed and arred about it at length because both head and heart say go out and buy a 700D instead, yet the more we've used the 100D the more we've grown to like it. Add mighty image quality from this mini model and it just doesn't make sense to score it any lower despite its shortcomings in context to the rest of the EOS range. It's an impressive bit of kit.